Sometimes when you get a run-of-the-mill sore throat it is something simple that heals over time. In cases where the sore throat lingers and invites other symptoms is when you need to worry. Being aware of other possible signs will let you know what course of action to take on day one. At Santa Cruz Ear, Nose and Throat Medical Group, we understand the significance of persistent neck and throat problems compared to a typical virus, which is why we’re here to help you with any conditions you might be experiencing. While an ENT specialist is a phone call away, letting effects linger may cause more damage than warranted. Below are some conditions related to neck and throat that you may be going through. If any of it sounds too familiar, then make sure to take action as necessary. This familiar feeling comes with a lot of associated symptoms. What to look out for with a sore throat is prolonged swelling in the neck, jaw and even tonsil area. As a result it will be hard to swallow or talk as the infection is being pushed out of your system. The uncomfortable nature of a sore throat can be remedied by over the counter medications, but remember that they just serve as a pain relief and nothing more. Infections that are built around a sore throat like body aches and fever may point to a more serious infection if it continues for an extended time. That extended time can be as long as a week, yet there are many qualifiers that point to needing to see a doctor sooner. If a rash develops around the area it could point to a more serious issue with the sore throat acting as a minor point. When a sore throat becomes so serious that you are coughing up blood or spitting out phlegm, then it’s time to see a doctor. The most common symptom that can be missed are early flu signs like high fever, with joint pain and sore throat. This is the trifecta of reasons to see a doctor immediately, so you shouldn’t delay. When both tonsils get inflamed and swollen, it can sometimes come from an infection. Common viruses and bacterial infections are the culprit, and there are some telling symptoms. Symptoms in adults can range from a stiff neck, headache and run of the mill sore throat. Young children get similar symptoms but may also experience stomachaches and drooling. Tonsillitis is something to really watch for in young children, as they usually won’t be able to describe their symptoms accurately. So while describing a stomachache may lead to a round of Pepto-Bismol, it is the complete opposite of what they really need. Since there are varying degrees of the condition, treatment will come down to the results of a few tests. Not all cases of tonsillitis are serious, and can be treated at home with adequate care. For bacterial infections, antibiotics are a great go to and may be prescribed by the doctor. When tonsillitis becomes a frequent issue, surgery, such as a tonsillectomy, may be recommended in order to prevent other medical issues from growing. Recurring tonsillitis can lead to obstructive sleep apnea and other breathing difficulties. It is a fairly simple procedure that lets you go home on the same day the surgery is performed. Cleft lip and cleft palate are defined as birth defects surrounded a baby’s face and mouth. When the tissue don’t fuse, it leaves an opening that carries several risks. The cause is still in the studying phase, yet many agree that a combination of genetic and environmental factors play a major role. Cleft lip can be seen outwardly with an opening on the lip that goes all the way up to the nose. A cleft palate is inside the roof of the mouth, where a part of it is open or both the front and back. With newborns being at a higher risk for infection, both of these conditions need to be treated immediately in order to ensure long-term health. Feeding, breathing and other infections are a concern if it is not treated in a timely manner. Treatment for the condition will vary based on each individual. There may be other factors in play that may put the surgery on hold like other defects. But if surgery is an option, for a cleft lip it takes place within a year of the child’s birth. Cleft palate has a longer range to operate and can be done within 18 months of childbirth. The surgery isn’t the ending treatment, as additional services through the growing life of the child will be a requirement to keep a healthy life. Several dangers to infections and breathing problems are dealt with during the surgery. The surgery isn’t just a cosmetic treatment, and shouldn’t be treated as such. Gastroesophageal reflux disease bothers a lot of people daily and should not be ignored. Heartburn and acid indigestion are the side effects caused by it, leading to a very uncomfortable lifestyle. When food goes into the stomach, the acid that is used to break it down is usually closed off. A weak esophageal sphincter can cause that same acid and food to go back into the esophagus. Complications from this happening can cause you to spit up some of your food, acid, and even give a feeling of a heart attack. This helpless feeling is only aggravated by breathing problems that can take place during a bout of GERD. Bloating and gassiness is a common result, and for many people the tightening of the chest and bloating of the stomach is such an uncomfortable feeling that it may lead to panic. Contributing factors to GERD are obesity, pregnancy and bad diet. A lot of the damage from GERD can be reversed by simple lifestyle changes and dieting. Cutting out trigger foods like chocolate and alcohol can go a long way to getting away from any of these symptoms. Some people are more sensitive to some foods than others, which is why a spice like pepper can be a trigger for one person and not all. Your doctor will recommend a diet plan that you should follow, and in many cases it won’t be as strict as you think. It should be pointed out that smoking weakens the esophagus and can be a leading cause of your symptoms. When GERD becomes chronic, medications are prescribed. Patients shouldn’t be reliant on over the counter antacids or Tums. A better choice would be a prescribed H2 blocker like Pepcid or Zantac in order to relieve symptoms. Proton pump inhibitors are also an option, and can include Nexium or Prevacid. These medications shouldn’t be abused or relied on for a lifetime, and diet and lifestyle changes are still necessary to eventually return to a healthy life. Medications aren’t the end of the rainbow, and people that suffer from chronic GERD may find themselves taking several tests in order to decide if surgery is the best option. Long term GERD can cause serious medical complications like cancer. Treating GERD early through diet, medication or surgery is important to keep it from causing further damage. Fundoplication is a procedure that will help the lower esophagus, but is not the only surgical option. Electrodes and other endoscopic procedures are available, so make sure to discuss available treatments with your doctor and find out which is best for your situation. RMS is a rare cancer that affects people under the age of 21. It is a branch of sarcomas, a cancer that attacks certain tissues in the body that are vital for everyday functions. There are three main muscles in the body, and they are skeletal, smooth and cardiac. Rhabdomyosarcoma affects the skeletal muscles that control moving parts of our body. It is a cancer that is more common in children than adults, with two main types of rhabdomyosarcoma. Embryonal rhabdomyosarcoma which is takes place within the first 5 years of a child’s life or alveolar rhabdomyosarcoma which can attack all groups and ages. Alveolar rhabdomyosarcoma is an aggressive form of rhabdomyosarcoma and more focused treatment is required. Since the cancer attacks muscles attached to bones, stiffness and soreness in neck joints may be a common issue. Recovery is very much an option and will depend largely on where the cancer is located and its size. Other factors like the type of rhabdomyosarcoma and how aggressive it is will determine what treatments are best for recovery. Successful surgery in many instances can completely remove the tumor. But even after recovery, it is important to keep up with general checkups and make sure that health stays on the upside. If you have been experiencing persistent or severe neck or throat conditions, contact our office today to set up an appointment with one of our knowledgeable and caring specialists! 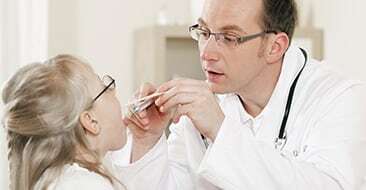 Our experts at are versed in treating many of the common issues and ailments of tonsils and adenoids.